Cricket is one of the most followed games in the world. It is considered as a religion in subcontinental countries like India, Pakistan, Bangladesh, Sri Lanka. It is also one of the most watched sports in New-Zealand, Australia and European countries like United Kingdom, Holland, etc.If a match is live in a stadium and if you’re not able to watch it, you can get the latest cricket updates through websites like cricket buzz, ESPN Star crickInfo. Users can also watch the live action on cricket streaming websites like Cricket Country. If a match is live in a stadium and if you’re not able to watch it, you can get the latest cricket updates through websites like cricket buzz, ESPN Star crickInfo. Users can also watch the live action on cricket streaming websites like Cricket Country. 2) Zapak:- This is yet another popular site to Play Cricket games online for free without downloading. When you open this site, you’ll see an option to choose one of the several cricketing events (including IPL i.e Indian Premier League). So what are you waiting for? Play open the websites mentioned above and play your favorite game i.e. 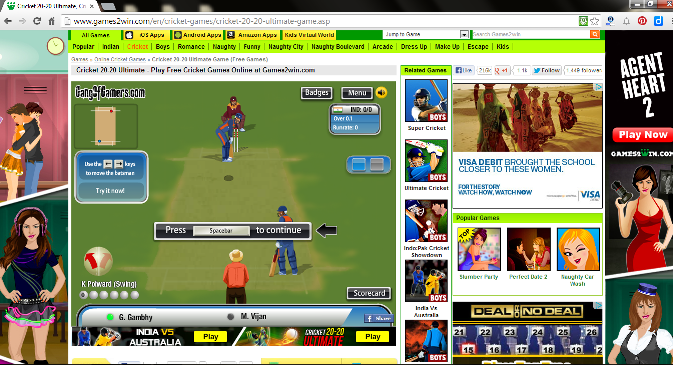 Cricket online.